If you’re looking for something new and exciting to get your little ones this holiday season, you can’t go wrong with one of these construction-themed toys which stimulate the mind and encourage imagination. This list contains the top excavator toys including something for not just boys but girls from the wide age range of 1-16 years old. Excavator toys, like many other construction-themed vehicles, have been around for a long time, somehow managing to remain relevant in an ever-changing and modernizing world. Similar toys date back to the 1940s from companies like the Nylint Corporation and Tonka. Of course some of the toys have grown increasingly more technical with the addition of motors, lights and sounds. But you’ll see some of the simple classic features in several of these modern-day toys. A perfect example to kick start this list would be Toy State’s Massive Machine Excavator. Toy State’s motto is “The State of Imagination,” showcasing to customers their focus on stimulating children’s inner creativity. This large excavator toy does just that. Features lights, vocals, music and motorized actions. Comes in push button and tethered remote versions. Play boulders included. This mid-range model of the classic toy features lights and sounds for a decent price. Sounds include vocals and music playing along with the motorized actions. According to Toy State’s website, this model is available in push-button or tethered-remote versions. Whether using the remote or push-button version, the buttons move the excavator machine forward or backward and move the arm up or down. The packaging of the product also includes play boulders to scoop up with the operating boom. All batteries for the motorized toy are included in original purchase as well, allowing your youngster to start play right away. This “massive machine” as they call it is about 19 inches long and weighs a little over 5 pounds. For other tracked loaders and toy skid steer equipment click here. 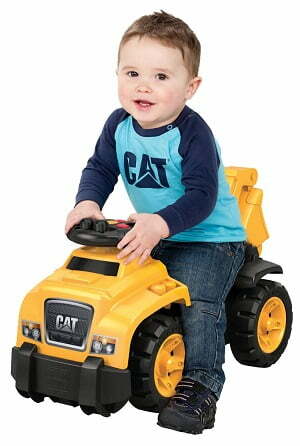 For the younger ones, consider trying out Mega Bloks’ CAT 3-in-1 Ride-On which is perfect for children 1 to 3 years old. Mega Bloks is another brand name parents can trust to foster creativity since it’s right in their mission statement. This interactive toy allows infants and toddlers the opportunity to scoot around on their own while riding a cool piece of construction equipment. With real-life sounds and controls, it’s sure to keep their attention. This unique ride is a combination with a steering wheel on one end and a fully-functional pivoting excavator arm on the other. They can practice scooping with 10 Mega Bloks bricks included with the purchase of this toy, bricks that can be built on top of the rider in various locations or used in the construction of their very own building when added with more Mega Bloks. Features include the pivoting excavator arm which swings 360 degrees, an opening under the seat where kids can store their extra bricks, and a small steering wheel to help young ones learn fine motor skills. The steering wheel has buttons to operate the construction sounds while turning the vehicle, teaching your toddler dexterity skills. Simple and sturdy for dependable play, this toy measures in at about 23.5 inches in length and 13.5 inches high. It weighs over 7 pounds. You can find more ride on toys for bigger kids here. Another really neat excavator toy comes again from Toy State, the CAT 15” remote controlled excavator with lights and sounds. This toy is a little more elaborate than the previous model we looked at (and therefore a little more pricey). 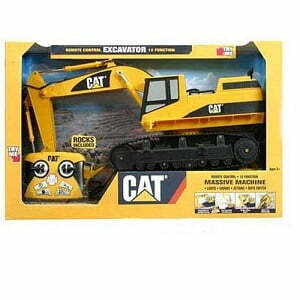 Kids can use the remote to maneuver this excavator around and pick up boulders which are included in the package, just like the other Toy State model. This massive machine runs on tracks similar to some of its real-world construction counterparts and features real-life construction sounds to allow for the full working experience for your little one. This toy features many of the displays and sounds that others do but for a steeper price. The rubber tracks are more durable than others allowing your excavator to take on the roughest of terrain and with a fully functional remote, your child will be able to get the full construction site experience. This durable toys is one of the larger remote control vehicles measure at about 22 inches long and over 6 pounds. All batteries are included for full operation. If you’re looking for something more simplified (and cheaper) without losing the lights and sounds with remote control features, consider Top Race’s 7-Channel Full Functional Remote Control Excavator. Top Race is a toy company focusing solely on remote control vehicles with top of the line technology. 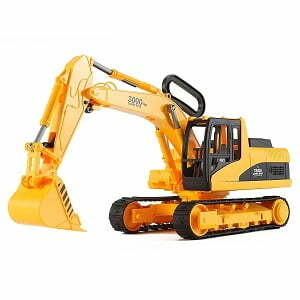 Similar to previous models on this list, this excavator toy is operated with a remote and features lights and construction sounds for a more life-like experience. Top Race 7 Ch Full Functional Excavator, Electric RC Remote Control Construction Tractor with Lights & Sound. The pivoting arm moves up and down to scoop up whatever you little kid’s heart desires. Top Race’s toy features a fully rotating platform, known in the construction world as the “house.” The arm and cab sit on top of this platform, swiveling to and fro as needed to get the job done. With fine details in a compact, durable body, this toy is perfect for inside or outside play for kids of all ages. The 7 controls on the remote move the toy forward, backward, left or right; move the arm up or down; and swivel the house around in either direction 680 degrees. The compact toy measure out at about 14 inches long and weighs only a little over 2 pounds. Unlike some of the other toys on this list, batteries are not included in packaging so make sure you come prepared. Not to be outdone by other toy makers, Top Race does offer an elaborate remote control vehicle, one of the most fully functional on our list in fact. This 15- Channel Full Control Remote Control Excavator offers everything your kid needs to get the job done with an extremely life-like construction experience. This is a professional, heavy duty model, one of the top models before you move up into the expensive gas hydraulic excavators for collectors. Because of its fine details, extreme control and mobility, this toy is more expensive and recommended for kids over 12 years old. 680° Degree Cab Rotation, 3 separate motors on digging arm to lift up and down to its full extent, much like a forklift boom. The 15-control remote offers the same controls as the 7-control remote but has greater control over the arm, breaking the arm mobility into four different operating functions including full control of the scoop of the bucket. The remote has a 2.4Ghz transmitter that is powerful enough to control the toy more than 100 feet away. Made of metal, this heavy duty machine operates and functions exactly like a real-life excavator vehicle, allowing it to actually dig into the dirt and get even the toughest jobs done. It measures at almost the exact same length as their previous version at about 14 inches long but weighs even less at right about 2 pounds. 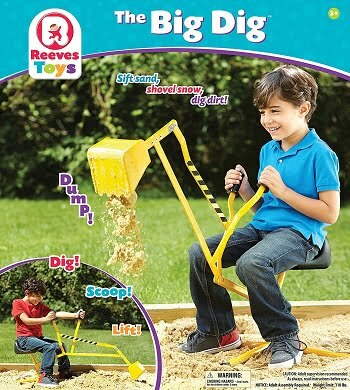 If you feel your young construction-minded kid is getting too old for toys, consider getting them this sophisticated model to keep that love for digging alive and continue encouraging creativity. From the oldest kids to the youngest kids, this option is great for your small ones. If you’ve ever wanted to get your inspired construction-worker-in-the-making an excavator-themed toy but didn’t know what they’d use it to dig into, Little Tikes has solved your dilemma with the all-in-one Big Digger Sandbox. This perfect-sized sandbox features a built in excavator arm and cab which rotates to dig wherever your child wants in the box. More than just a sandbox and excavator toy, this ensemble comes with several accessories including shovels and tools to help with the digging process and a dump truck to haul away your loads. 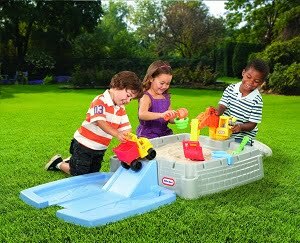 The sand area features molded in ramps for fun play and holds approximately 100 pounds of sand (sand is purchased separately). Other accessories included are two small construction workers for your child to use to operate the excavator and dump truck. The excavator arm really dips allowing the bucket to actually scoop up dirt. Your kids might get a little dirty with this one, but they’ll love it! This is the perfect toy if you’re looking for something to get your child outside and sparking their creativity with hours of playtime in the fresh air. Little Tikes even smartly included a lid to cover up after use in order to save your sand and play area for next time. The lid also doubles as a truck ramp while your little ones are using the sandbox to expand their play area. This child-size sand box measures at about 61 inches long, 47 inches wide and 13 inches tall. Getting back to the classic, Bruder sticks to an extremely life-like replica of an actual excavator with their 1:16 Scale Vehicle. As its name indicates, it is on a scale of 1:16 to its real-life counterpart, and it maneuvers similar to the real deal on genuine chain link tracks. The toy makers’ attention to detail on this toy is showcased in areas like the realistic ventilator displayed under the hood when opened. Unlike previous models on this list, it is not remote operated but is instead maneuvered with a child-size handle on the rig. The bucket has excellent teeth to help really dig into tough dirt and the cab rotates 360 degrees to get wherever needed to start digging. With the absence of any lights or sounds, this classic toy is so similar to the real-deal construction site vehicle that it even features a “safety” feature to slow down the tipping-out function when emptying the shovel. More neat features include rubber inserts to place on the tracks when playing with the toy on surfaces like tile to protect the floor and help prevent kids from slipping around. This larger toy measures just under 23 inches long and weighs a little more than 4 pounds. Because of its large size, realistic attention to detail and durable structure, this is actually one of the more expensive non-mechanical models on our list. Next on our list is another toy the smaller ones can ride along on. Fisher-Price’s riding excavator is slightly more durable than Mega Bloks’ and therefore has an older age range of 18 months to 4 years old. The arm and shovel are also exponentially larger on this Big Action Dig N’ Ride, allowing for larger loads than the previous ride-on toy. The large tires on this toy allow your child to easily maneuver around the house. The child-size dual-control handles on the excavator arm allow even the youngest ones to be able to figure out how to scoop with the bucket. These actions will help your child build great hand-eye coordination and dexterity while allowing them feel like a real construction worker. If the easy to use features aren’t enough to keep your child’s attention, this toy also features construction sounds and a place for storage under the seat similar to the previous ride-on toy. 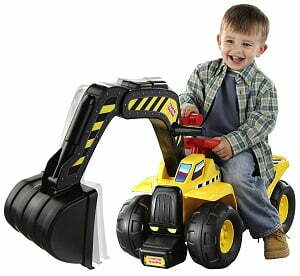 With a cool style and fun functions, this toy is sure to be a hit among the younger excavator operators. It measures at just under 22 inches long and more than 13 inches high with a weight of approximately 11 pounds. It also comes with all the required batteries to use all of its fun functions. Similar to Bruder’s classic style, the next toy on our list is available on Amazon for a much cheaper price due to a more child-like structure of the toy. It doesn’t feature any metal parts or pieces, being made of plastic with all rubber tracks, and is therefore a more affordable and kid-friendly option for the younger kids. Like the previous classic model we saw, this toy is not operated by remote control but with a handle on the arm which lowers and scoops the bucket. It’s easy for small hands to maneuver and features a fully rotating house. Despite the more kid-friendly make of this toy, it features fine attention to detail just like Bruder’s excavator. 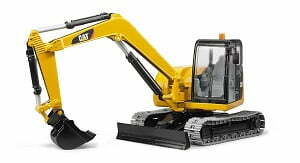 The Big Construction Excavator has a life-like cab with seat and ventilator grill under the hood. Without lights or sounds, this toy might not be for children who want that extra stimulation but is perfect to build creativity and spark inspiration in those looking for a more life-like replica of the real construction vehicles. The compact size could also be a plus for anyone not wanting another bulky toy in the house. Fully extended it measures at about 15 inches long and weighs less than 2 pounds. Want to get your child started off at a really young age with something even more simple, smaller and durable? 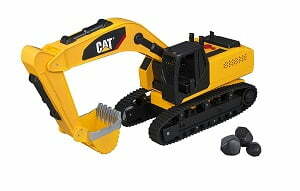 Consider Toy State’s CAT Tough Tracks Construction Crew Excavator which is part of a Construction Crew set featuring other construction vehicles such as the bulldozer and dump truck. These small machines can be purchased separately or in 2-pack sets. 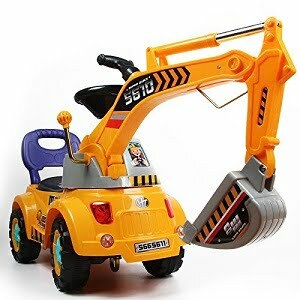 The great thing about this 10” version of the excavator is the small, compact simplicity that allows the really small hands to easily play for hours without any need for batteries or fine motor skills. Rolling around on thick wheels, the excavator features a rotating house and extendable arm with a bucket that actually scoops. The best part is, because of the durable structure of the toy, it’s great for indoor and outdoor play so kids can feel free to dig up as much dirt as their little heart desires! At 10 inches long it only weighs about 1 pound. Back to Bruder! 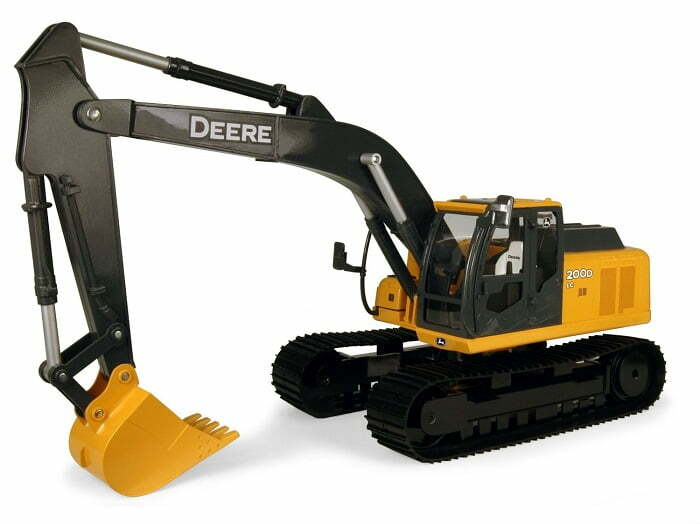 This toy is called the “Mini” Excavator because of its more compact build than the original excavator vehicle. Its features are similar to the previous Bruder model we looked at, but it can fit into tighter spaces with a slimmer body and slightly shorter tracks. With the same attention to detail as the larger toy, this mini excavator features a detachable bucket, intricate cab displayed when opening the door, and grill under the bonnet. The durable tracks and rotating house allow your kiddo to get the job done wherever necessary, however the one feature this toy doesn’t have similar to the larger version is an easy to use handle. The arm still swivels and bucket still scoops, but the child must make these maneuvers by hand. Unlike the previous Bruder model, this toy actually has a small, thin bulldozer shovel on the front to help this excavator get where it needs to, even in rough terrain. If you’re looking for something with the realistic details Bruder promises but smaller (and cheaper), this could be a great option for you. It lacks the flamboyant lights and sounds some of the other toys on our list feature, but has a more accurate representation of the real thing for kids with imagination. It measures in at about 16.5 inches long when fully extended and weighs approximately 10 pounds. That’s right, another ride-on toy for the list. POCO DIVO’s toy is even more elaborate with greater and more intricate features than the previous ride-on toys, making it a definite hit for kids up to 5 years old. The seat actually includes a back, allowing toddlers to get comfortable and stay steady as they play. This toy can convert to a scooter but when the excavator cab is attached to the front, children can swing it side to side and maneuver the arm and bucket with easy-to-control handles. It takes a little more dexterity to maneuver the handles on this ride-on so it might be better suited for older toddlers, but the flashing lights, music and sounds are sure to grab any child’s attention. The ride-on construction toy has a steering wheel with buttons to help your kid easily get where they’re going while having a great time. Some assembly is required for this more detailed and complex scooter toy and it actually comes in different colors, yellow or aqua. More than just a scooter or ride-on toy, this excavator can actually turn into a pulling car with a place to attach a small rope so mom can take their little ones on walks. But wait there’s more! The toy also comes with a three piece garden tool set to help your child really get the job done and these toys can be quickly and easily stowed away under the seat which opens up. Measuring at about 25 inches long and 13 inches high, this amazing digger scooter is sure to be a favorite of boys and girls less than 5 years old. From one extreme to the other, this simple toy is anything but elaborate. No bells or whistles, this toy is small, on a 1:90 scale of its real-life construction site inspiration. It features some realistic details in the cab and arm in a very compact package. Made of diecast metal, this toy is part of a collection from Toy State featuring other construction vehicles, great for collectors with a construction interest. With the durable and intricate design, this toy could be fun and safe for the smallest children since it is painted with non-toxic paints, while still being a fun collectible item for the older kids or even adults. Because it is diecast, the maneuverability is limited but the tracks are soft rubber allowing for movement by hand. This tiny toy is about 5 inches long and weighs in at a little more than 3 ounces. This would be a great option to consider if you’re looking for a toy to last them a long time, especially if you purchase it with the others in its set. 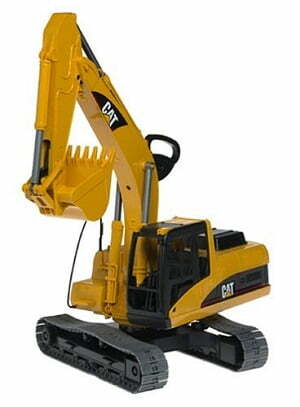 Yet another remote controlled excavator toy for our list. The great minds at ThinkGizmos designed this toy on a 1:45 scale to look and operate just like the real deal. 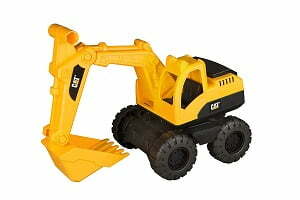 With the remote, children can maneuver the toy forward, backward, to the left or right, and operate the digging arm. The remote also allows the cab to spin 680 degrees. 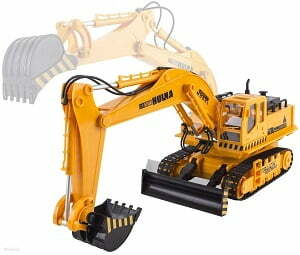 Detailed fully functional remote control toy excavator with lights and sound. One of the most perfect remote control toys gift for any kid over 3 years old. Encourages imagination and concentration. ALL REQUIRED BATTERIES ARE INCLUDED. Move it Forwards, backwards, left, right, or manoeuvre the arm up/down. You can also turn the cab 680° Degrees. Includes stickers so you can customize it yourself. Certainly one of the coolest construction vehicles toys for boys. 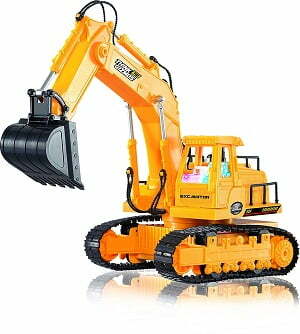 This high spec 1:45 excavator scale model is just like the real thing and can be used indoor or outside (as long as in dry conditions). Stick it in the sandbox and let the fun begin! 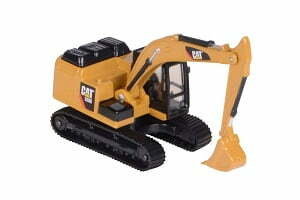 Remote control excavator measures about 14” long and is made from safe Non-Toxic Recyclable ABS Plastic. Unlike competing models this one comes with all required batteries included. Toy excavator comes in a well-designed box with user manual included in the following languages (English, Spanish, German, French, Italian). Quality ThinkGizmos branded toy protected by international trademarks. Lights and sounds make this toy even more exciting and the included stickers allow kids to make their excavator their own. The heavy duty toy was designed to operate inside or outside in dry conditions, allowing kids to use it to dig in actual sand and dirt. ThinkGizmos even includes all required batteries with the original purchase so kids can get to playtime even faster and easier. The toy measures out at about 19.7 inches long with a fully extended arm and weighs approximately 3 pounds. It also ships with a user manual to answer any questions you or your child may have about safe operation. For more rc trucks click here. One of the more elaborate remote controlled excavators on our list comes from WolVol. This toy has 11 different functions on the remote which can move the excavator forward, backward, and turn left or right. The remote can also swivel the house of the excavator and raise or lower the arm. The additional feature on this particular toy is the small bulldozer shovel on the front of the machine which can also be moved up and down with the remote. Of course, it features intricate lights and sounds as it moves around and kids can sit back and enjoy it all with the demo mode this toy features. In demo mode, the excavator will show off its own maneuvers without any needed operation from the player. With the fine details, extra features, various play modes, and complete functionality this excavator is perfect for your little engineers. It even comes with all the necessary batteries for kids to get busy right out of the box, making this a great option. It is about 21 inches long and weighs approximately 3.5 pounds, making this toy a lot bigger than the only other remote control vehicle on our list that is more elaborate, Top Race’s 15-Channel RC Excavator. Click here for more remote control bulldozers. At first glance, Kid Galaxy’s Mega Construction Remote Control Excavator appears similar to the previous toy we looked at from WolVol since it appears around the same size and also features a small bulldozer shovel on the front. 10 Functions: Drive forward, backward. Turn left, right. Scoop or push back debris. Move bulldozer blade up and down. Rotate cab left or right 680° degrees. Simulated digging and work sounds (with mute button). 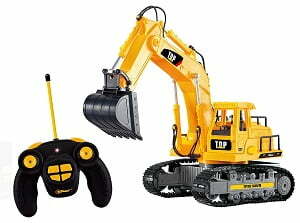 Command-Center-Style Radio Control with joystick imitates real excavator controls like you’d find on a premium rc toy. 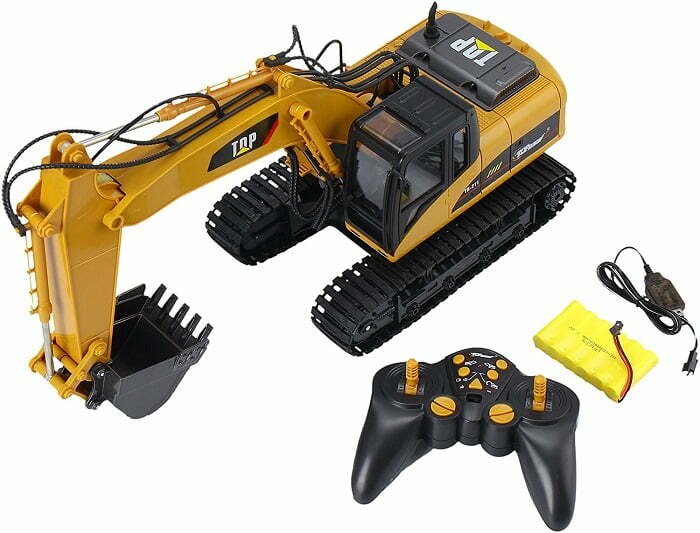 However, at second glance you’d see this cool toy comes with a unique remote controller that is built just like realistic controls inside a full-size excavator vehicle, unlike any other toy on our list. The controller has a handle and joystick with different buttons to move the excavator back and forth, turn left and right, swing the cab in either direction in 680 degrees, and move the arm up or down. 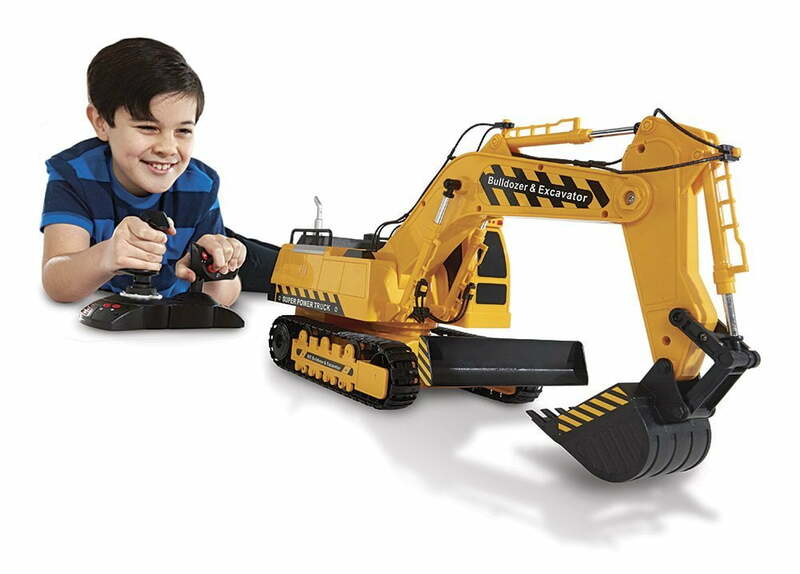 Beyond just a unique controller, this excavator toy also features really neat digging and construction site sounds with an included mute button for quiet playtime. With rubber tracks and the bulldozer front, this machine is easy to take onto uneven terrain and get to work wherever your little one desires. This toy is operated with a 4.8V rechargeable battery which is included with a wall charger for powerful performance. It measures in at about 17 inches long and a little more than 5 pounds. Kid Galaxy offers a smaller, cheaper, simpler version in the 6-Function Toy Tractor Digger which operates using a normal remote control with more limited actions. Without the cool command-control style remote and high powerful performance, this toy is better suited for younger kids and light play. 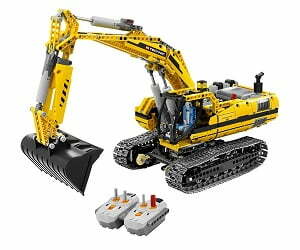 Very different from any other toy on this list, this fully functional motorized excavator toy actually comes in 1,123 different Lego pieces which the player assembles themselves. This technical Lego set with tiny pieces and complex directions is obviously for the older kids, with a suggested age range of 12-16 years old. But it could most certainly be a hit with the insane functions it features after ensemble. This Lego set is motorized and operated with a remote control just like previous toys on this list. The cab swivels in either direction in a full circle and the arm with the shovel moves up or down for actual digging action. With a powerful motor and deep bucket, this elaborate Lego Technic set appears to be just as functional as any other toy featured here. One thing to keep in mind though is the fact it is made of Legos and will therefore be a little more fragile. The details of this machine are elaborate as your child will get to see and experience firsthand as they assemble it. Actually building the excavator’s inner parts will allow young engineers to see how this toy operates. Every intricate piece adds to the extravagant final product which is fun in and of itself to play with. It includes four motors, two receivers, two remote control handset, and four linear actuators, making this machine the real deal. Finally, after putting the set together and playing with the excavator features, your young engineer still has lots of newfound fun left. This cool Lego set allows them to take it apart and use the same pieces with an extra set of instructions to build a whole different toy, the tracked loader. This toy is obviously the most expensive on our list since it is from Lego and includes so much with it. After assembly, it measure at more than 18 inches long. 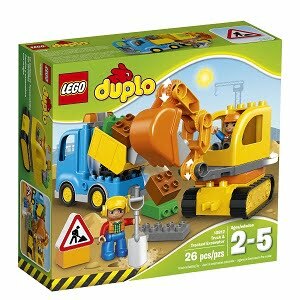 Speaking of Legos, they also have something for the younger crew with this Duplo Town truck and tracked excavator building kit. With only 26 Lego Duplo pieces, this simple set is easy for little kids to put together, with a suggested age range of 2 to 5 years old. The size of Lego Duplo pieces are great to help young toddlers build dexterity and build basic construction skills. The excavator in this set is built as life-like as Lego Duplo allows as it sits on moving tracks and features a spinning cab. The shovel even scoops at the end of a maneuverable and arm. The set contains extra Lego blocks for the excavator to scoop up and place into a dump truck also included in the set. Finally, the package is wrapped up with two construction workers and added accessories like shovel and street sign. 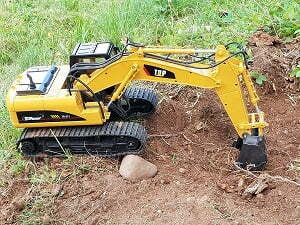 ERTL Big Farm created a very life-like toy with the John Deer 200Lc Excavator on a 1:16 scale. The elaborate details make it actually look like a shrunk down version of the real-life construction vehicle. Even with the intricate details, including a finely painted chair in the cab with the John Deere logo, this toy is durable enough for play inside or outside. Featuring realistic construction sounds and lights, this toy is a great option for your budding construction-enthused child. It is another toy without a remote or handle to operate the cab or dipping arm but the lack of extra features, make this model seem just that much more real and is great for young ones with a lot of imagination who love heavy equipment toys. The best thing about this cool toy, other than its down-to-earth realistic appearance, is the size. Fully extended it is almost 24 inches, making it the largest toy on our list (other than the ride-on vehicles and sandbox). It weighs approximately 4 pounds. If you’re looking for bigger John Deere toys, check out the top 10 best John Deere riding toys for children here. Finally, to wrap up the list, we have one different than all the rest. This particular toy will really get your kid moving, encouraging creativity and outdoor exercise at the same time. Your child gets to actually sit at the controls of this excavator crane to dig into dirt and sand. The two-handed controls can help build strength and hand-eye coordination in your youngster. Of course, this toy must sit in a place where you don’t mind your kid digging, possibly an already installed sandbox. But if you have the place for it, your kids will love it! Something to keep in mind is it could also dig up snow making it a fun toy even in the winter time! The chair swivels around, allowing the player to dig where they need to and the bucket can lower and scoop with the controls to pick up the sand, dirt or snow. Similar to other ride on toys, this ride on sandbox digger is meant to be stationary, though there are some other ride on toys with wheels like the Peg Perego models you can find here. There is some assembly required for this toy but with a sturdy metal frame, this ride-on crane can actually hold up to 110 pounds, making it a hit with older kids wanting to play construction worker. Assembled, this ride-on toy sits at more than 44 inches high but only weighs a little more than 10 pounds, allowing you to move it around as necessary. You can find other diecast cranes here.